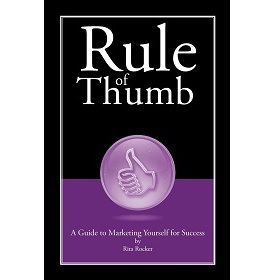 Rule of Thumb: A Guide to Marketing Yourself for Success is a book in the Business genre written by Rita Rocker. The book was published by WriteLife on 2012-01-05 and contains 66 pages. The book has an ISBN number of 978-1608080489. Our users found the overall impression of this book to be Educational. Most of us know quite well how to market products and services for our business success. But how often do we consider how we market ourselves for business – and personal – success? Rule of Thumb: A Guide to Marketing Yourself for Success conveys many “tricks of the trade” that will help you make sure that you present yourself as a polished and competent professional. Anything less could derail your business. Author Rita Rocker – national inspirational speaker, communications and image specialist, career and virtual presentations coach, and a former Mrs. Nebraska – dispenses her knowledge and expertise in personal image-building to help you always present yourself in the best possible manner to create that unmistakable professional presence. Rita presents straightforward and easily understandable approaches to the dos and don’ts of creating a confident self-image, making a positive first impression (usually made in seven seconds or less), practicing accepted business etiquette, dressing in proper business attire to meet specific situations, and mastering business communication skills. Nonverbal communication skills – those all-important non-spoken messages (body, facial, and tone-of-voice signals) that always override what we say if the words and actions do not match – are presented clearly so that you will quickly learn what nonverbal actions do and do not work. Included in this valuable guide are easy, but extremely effective, step-by-step exercises for you to assess your current abilities in successfully marketing yourself as a seasoned professional, as well as exercises for improving your skills in each of the components that contribute to the successful marketing of yourself. Numerous clear and familiar examples accompany the dos and don’ts for presenting yourself as a confident, knowledgeable and competent business professional. Rita also reminds the reader that these skills are just as valuable in one’s personal life as they are in one’s business life. Because the skills presented in this professional guide, along with the excellent information on how to improve these skills, will increase your professional persona to the great benefit of your business endeavors, I highly recommend this book to everyone who wants to make sure that his or her professional presence truly makes the most positive impact possible.